It is crucial for your pet’s vision that we detect and treat glaucoma and other problems with intraocular pressure (pressure within the eye) as quickly as possible. We can test your dog or cat’s eyes for excess pressure. The test, performed with a device called a tonometer, is not painful and does not require sedation. If not treated immediately (within hours to days), glaucoma can cause permanent vision loss or even blindness. Pets that have suffered eye injuries should have this test performed. In addition, we recommend that breeds that are prone to developing glaucoma come in for regular measurements so we can monitor eye pressure and begin treatment before any problem becomes irreversible. 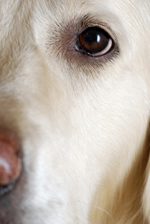 Please call us to discuss whether your pet may be at higher risk for glaucoma. Call us right away if you notice any of the following problems in either or both of your pet’s eyes: dilated (enlarged) pupils, clouding of the cornea (the normally clear outer layer of the eye), red or bloodshot eyes, one eye protruding or appearing larger than the other, squinting, or tearing. Because glaucoma is painful, your pet may react by rubbing or pawing at the eyes or rubbing his or her head against the floor or furniture more than normal.